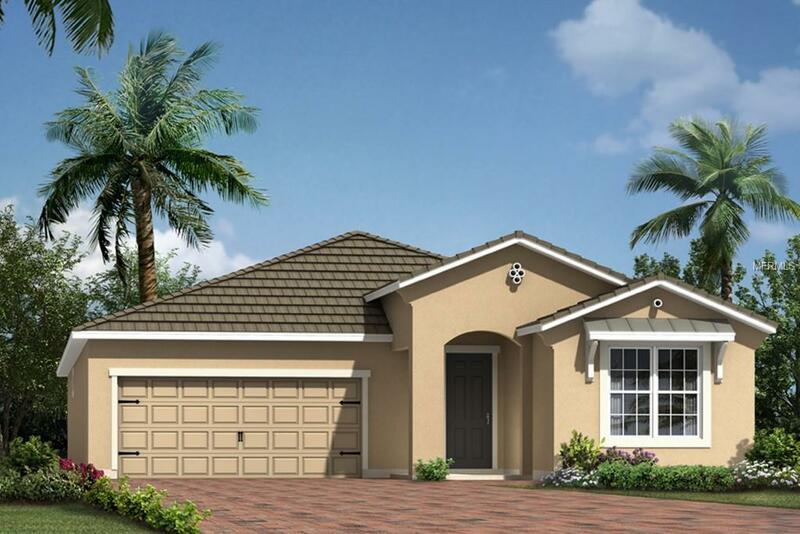 This 3 bedroom, 2 bath home with West Indies elevation comes with tons of upgrades! Start out with the gorgeous Picasso 12 x 24 tile flooring as you walk down the extended hallway featuring tray ceilings. Your first two bedrooms are situated off of the hallway with a full bath. The study is located in the same area, great room for an at home office or formal sitting room. Always find your keys when you leave them on the stop and drop as you walk into the open kitchen, dining room and gathering room. Large flowing plan is great for entertaining guest. Breakfast bar on the kitchen island is a great place to house food while guest mingle from the large gathering room onto the lanai which is accessible from the large sliding glass doors in the dining room and the gathering room. Kitchen is a focal point itself with the 42" upper cabinets painted Harbor with Coarse Pepper Zodiaq Quartz counter tops, stainless steel appliances, all KitchenAid. It all ties together with the 3 x 6 Baker Street tile back splash. This kitchen is meant to be seen! Tucked away behind the kitchen is the owner's suite. Elegant tray ceiling, triple windows across the back, bath features a long dual sink vanity on raised cabinets, Crema Pearl granite counter tops, large shower, linen closet and a big walk in closet with double hung racks.